I feel like I haven't been in this space for a while, and indeed, when I looked it has been over a month. But school's begun and with it my work schedule has gotten back on track. I've been throwing a lot, planning for upcoming events, and working on blue and white pieces. Yesterday I spent about three hours doing inlay work, which is my most favorite thing ever. 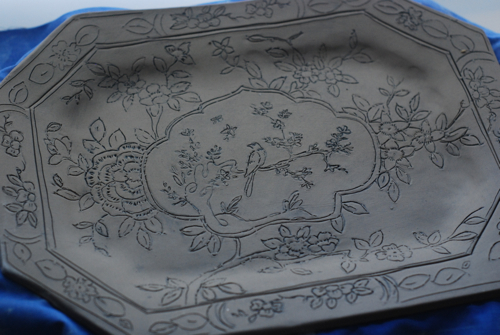 This small tray is based on a set I stumbled across this summer. Adams Singapore Bird. The original is multi-colored on a celadon ground. It is a very busy pattern and I've simplified my copy. It's so busy that I don't think it will really go into rotation, but I do just love it. Several friends told me that their families had this pattern, and I'm working on some special pieces based on this pattern, for them. And although I don't plan to duplicate Singapore bird, I'm more than happy to appropriate some of the floral motifs on the pattern. I used several on pieces I worked on yesterday. We have a big family wedding coming up. The bride, one of my youngest cousins, was my flowergirl 14 years ago. She is having a high-tea reception and picked out some lovely tea things on her registry. One of these blue and white teapots will go to her. Teapots have deviled me for some time, but I think I worked out a few construction problems on these pots. I've spent the summer down to one kiln, the big one, which I can't run while the air is on. I finally finished replacing the elements (with the help of a good friend who helped me with the electrical part of it), so I'm glad to have a kiln I can run while the weather's still so warm. I have a load to fire over the weekend, then glaze next week. I'm excited to show you some finished pieces soon. Have a lovely weekend, friends.